Save time and money by pre-booking your departure transfer from Shanghai to Pudong International Airport. 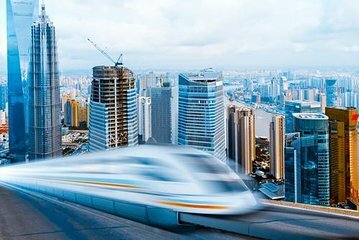 Your representative will meet you at your Shanghai hotel and accompany you on-board the high-speed Maglev train to ensure you make it to the airport on time. Not only will you dodge the traffic and avoid high taxi fares, but you’ll travel to the airport from downtown Shanghai in just 8 minutes! Our guide was perfect and made the trip to the airport unexpectedly exciting.....He encouraged us to pose for pictures and we, of course, love those photos now that we are home. He was so helpful with our luggage that we look back and ask ourselves how we could have managed without him. Again, our last day in Shanghai was a great experience. Tom was simply amazing and we cant recommend this tour highly enough. We are so grateful to Tom for his assistance and taking care of all our details for the tour. Thoroughly recommend Mr Tom. He picked us from our hotel and saw us all the way through to check-out. Excellent English and most forthcoming on local sights and customs. The easiest way to catch the Maglav. I am unable to rate the Maglev Train transfer as we chose to change to a car to take us directly to the Airport. We were worried that we had too much luggage for an easy transfer to the train. The driver was 15 minutes late picking us up but was very apologetic and got us to the Airport in plenty of time. He was very helpful with our luggage and very pleasant and talkative. A good experience! This is an excellent service. I made the reservation and paid for it before I left home. I received a voucher. When it came close to time for the trip to the airport, I was contacted to confirm the time and place of pickup. Then the day before, I received a call at my hotel to again confirm. This reassured my confidence in the service. And as expected, the guide was punctual. The trip from hotel to train station to airport was seamless and pleasurable. The guide, Mr. Tom, was courteous, helpful, and knowledgeable. I enjoyed talking to him. He took care of my luggage and took me to the check in point in the airport. All of this made a trip to the airport easy and stress free. But also important is the experience of riding the Maglev train. Smooth and fast. I highly recommend this service...and experience. Guide was very helpful and would recommend as a unique experience. The pick up was seamless. The guide had called and confirmed timing and flight details the day before. Clean van and the guide spoke flawless English. He helped carry the baggage at the train station and was with us until we checked in. Would recommend this service. Great service. Host was on time for pickup and led us through the train exercise and the airport, providing help with our bags. Really satisfied. We had too much luggage for a happy Maglev trip and I asked to change to car transportation from the hotel to the airport, and this was quickly organized. Our guide was very helpful at the airport.